About 90 minutes before most road games, New York Mets relief pitcher Buddy Carlyle can be found in the outfield, giving one early-arriving fan a memory for life. 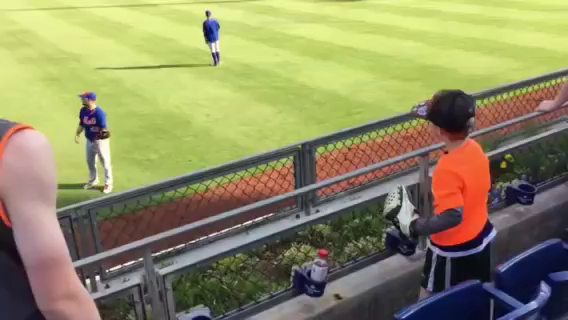 While his teammates take batting practice, Carlyle stands on the edge of the warning track and scans the bleachers for a child who catches his eye. When he finds the right candidate, he lobs a baseball over the fence and into the kid’s outstretched glove. It is not just a souvenir—not yet, anyway. Carlyle expects a return throw from the boy or girl. Then he tosses it back, again and again, until it becomes clear to everybody just what is happening. At this point, nearby fans tend to reach for their smartphones to start snapping pictures and recording videos. No one interferes with the proceedings. They’re watching a major-league pitcher play a legitimate game of catch with a kid in the seats. And remember they do, so much so that Carlyle has amassed a legion of devoted fans, a group comprising kids he has played catch with through the years–and their parents. Before Saturday’s game against the Philadelphia Phillies here at Citizens Bank Park, Carlyle spotted Kate Wellington, an 8-year-old from King of Prussia, Pa., wearing a gray T-shirt adorned with a Phillies logo. He told Kate that he chose her because she had a pink baseball glove on her hand, explaining that his daughter, who is about the same age, has a pink glove, too. “I don’t have a good memory,” she added, and was a bit concerned that she might not remember all the details of her catch. “Because my dad didn’t videotape it!” she said, shooting her father a playful glare. Sometimes, Carlyle is actually able to recruit new Mets fans. Before Friday night’s game against the Phillies, he played catch with Vasili Dizes, a 6-year-old from Philadelphia. Vasili’s father, Nick, grew up rooting for the Yankees. But after the experience with Carlyle, it seems his son has converted. Carlyle, a 37-year-old journeyman originally from Omaha, Neb., said he has been playing catch with kids in the stands since about 2007. He has bounced around professional baseball since being drafted by the Cincinnati Reds in 1996, playing for five major-league teams, with stops in Japan and South Korea along the way. In 149 career games, Carlyle has a 5.15 ERA, but he has pitched well since latching on with the Mets last season. On Saturday, he entered the game in the eighth inning with the bases loaded and one out, inducing Phillies catcher Carlos Ruiz to bounce into a double play, in the Mets’ 3-2 win. Speaking in the Mets’ clubhouse on Saturday, Carlyle said he is generally only able to play catch before road games. At home, the Mets tend to go out for batting practice before the gates open to fans. He downplayed the routine, saying that in the long history of heroic major leaguers, he’s about as anonymous as they come. When approached, he expressed reluctance to talk about it at all, not wanting to shine the spotlight on himself. “I’m just sorry I’m not somebody cooler,” Carlyle said. The kids he plays catch with might disagree. Once used as a weapon to ward off potential intruders, a previously unknown Lou Gehrig Hanna Batrite model game bat has been uncovered and will be featured in an upcoming auction. 1929-31 Lou Gehrig game-used Bat Rite batLove of the Game Auctions will feature the 35 ½”, 37.5 ounce bat during its summer catalog sale. It dates to the 1929-1931 time frame and is one of fewer than 20 known examples of Gehrig game bats in existence. It’s been graded GU 8.5 by PSA/DNA. 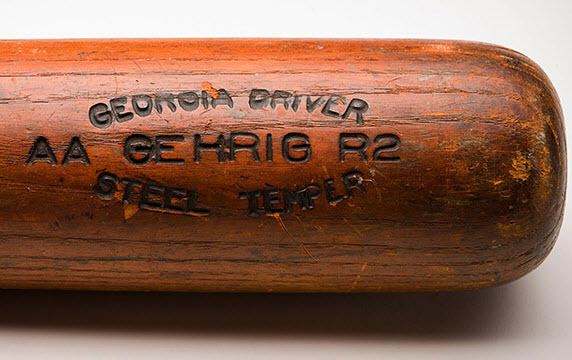 Gehrig bats rank among the hobby’s five most desirable for collectors, according to PSA, sharing that distinction with Babe Ruth, Ty Cobb, Ted Williams and Jackie Robinson. Gehrig used Hanna’s Batrite model for a couple of seasons during his career. Hanna Manufacturing was based in Athens, Georgia and Gehrig is on record as stating he ordered them from the company. Pictures taken around 1930 show Batrite models around Yankee players including Gehrig. According to Crisafulli, early word of the consignment has been met with strong enthusiasm, although he didn’t want to speculate on what the bat might sell for. LOTG’s summer auction will open in late July and run through early August. Baseball Hall of Famer Yogi Berra, considered by many to be the greatest catcher in history, turned 90 last week. 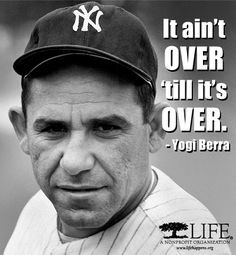 Berra spent 19 seasons with the New York Yankees and finished his career with three MVP awards, 15 All-Star game appearances and 12 World Series home runs. He holds the record for most World Series games played with 75. Last year, I wrote about Yogi’s war record. He fought alongside his fellow sailors and soldiers in June of 1944 as Allied forces stormed Normandy Beach for the D-Day invasion. That’s quite impressive and heroic, yet he has never made a fuss about it. Something else Yogi has never discussed was his advocacy of civil rights in his sport. He was at the forefront of welcoming African-American and Latino players to baseball in the 1950s, often serving as their personal mentors. Berra is also a tireless supporter of the disabled and has raised and donated millions of dollars to improve the lives of those most in need. Berra’s habit of speaking his mind, with both fractured syntax and sound logic, has endeared him to many. Phrases like, “It ain’t over ’til it’s over,” “It’s deja vu all over again” or “Nobody goes there anymore, it’s too crowded” have made him one of the most quoted Americans ever. To recognize Yogi’s place as an American icon, a petition has been created to award Berra with the Presidential Medal of Freedom, one of our nation’s highest honors. The only way it can happen is if 100,000 Americans sign the online form by June 1st. You can find the link at his museum’s official website www.YogiBerraMuseum.org. From The Wall Street Journal and Sports Collectors Daily.